Honey Bunches of Oats consists of a mixture of whole and processed grains, including whole-grain wheat and oats, and processed corn and rice. It's fortified with iron, zinc and a variety of vitamins. It qualifies as a healthy cereal by some standards, such as calories and fat content. However it's not an optimal source of fiber or folate. The basic cereal is available with a variety of ingredients, so check the label for changes in nutritional values. 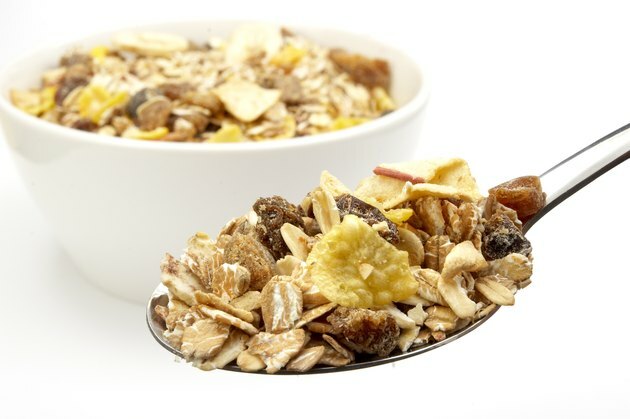 Some types of ready-to-eat cereals have a small amount of fiber from ingredients such as nuts or fruits, but whole grains are the primary source of fiber in Honey Bunches of Oats. A claim on the front of the packages states that every serving provides 10 grams of whole grains. That translates into 1.5 grams of fiber in a three-quarter cup serving. Your breakfast cereal should contain at least 3 grams of fiber per serving and preferably 5 grams or more, according to Clemson Cooperative Extension. Clemson Cooperative Extension recommends choosing cereal with little to no sugar, or at least limiting the total sugar to less than 8 grams per serving. Honey Bunches of Oats is close to the limit with 6 grams of sugar in a three-quarter-cup serving. Some of the total sugar is naturally provided by grains, but you'll also get added sugar. While you can't determine exactly how much added sugar is in the cereal, any type of sugar listed in the ingredients represents added sugar. Honey Bunches of Oats lists sugar as the second ingredient, which means it's the second most prominent ingredient. The list also includes corn syrup, honey, corn and barley syrups, which are all added sugars. Your breakfast cereal should have enough calories, carbs, protein and fat to boost your metabolism and give you energy. One serving of cereal should have between 100 to 200 calories, preferably about 120 calories, according to Clemson Cooperative Extension. Their guidelines also recommend choosing cereal that has 2 or more grams of protein and less than 3 grams of fat. Honey Bunches of Oats is a healthy choice by these standards because one serving has 120 calories, 2 grams of protein and 1.5 grams of fat. You don't need to get 100 percent of your daily value of every nutrient from a bowl of cereal. Just look for 10 to 25 percent of your daily value of key nutrients, such as iron, folate and vitamins A, B-6 and B-12. Before milk is added, one serving of Honey Bunches of Oats supplies 60 percent of your daily value of iron and 25 percent of all the B vitamins except folate. It doesn't contain any folate, according to the producer's nutrition information. You'll also get 10 percent of vitamin D and 15 percent of the daily value of vitamin A. Is Puffed Millet Cereal Healthy?